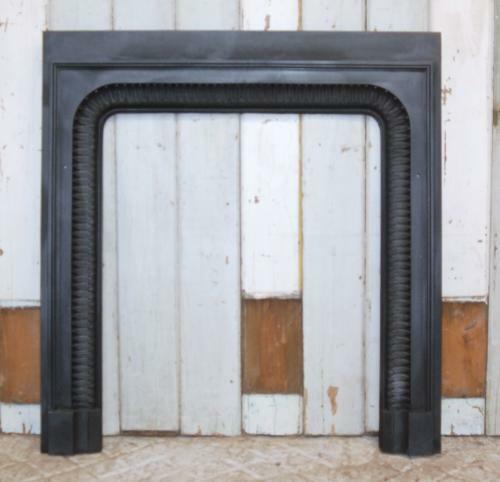 A very attractive Regency Georgian cast iron fire trim suitable for use with a wood burner or fire basket. The trim is ornately decorated with a stylised leaf / palm design, typical of the era, that surrounds the trim opening. The feet have traditional detailing and a moulded border surrounds the leaf design. The trim has been blacked and polished and has a nice finish. The trim is in very good antique condition and has only small signs of age and wear. The item is solid and well made and is without breaks or cracks. Some casting marks can be seen and some very small marks and knocks. The back has surface rust as expected. The trim is ideal for adding character and period charm to a fireplace and could be paired with a surround. The trim is a fantastic example of Georgian design and is a very desireable item.